Set My Picot Free Award Winner! So, I was doing a search for belly dancing costumes…and what do I find? http://www.crochetkitten.com/ she has tons of patterns she’s made, and they are so totally awesome. I contacted her on Ravelry.com and asked if I could use her images here because they are just too nifty. She wasn’t a CLF member at the time, though she might be now, and I’m not gonna check because well..it just doesn’t matter…I’m awarding her the Set My Picot Free for some awesome crochet representin’! Instead of a meme…Let’s do a round robin, or a simultaneous list of our favorite things about crochet? So, do this for me, and pass it on in your message boards, and email lists. If you have a blog, make a list of your 25 reasons you love crochet! Do it anyway you want, 25 photos, or a list, I don’t care how you do it, but when you DO blog this, come back here and link your blog post so I can see your wonderful work!!! Hmmmm…Next question of those 99 how many buy Crochet World? Second Book. Sadly not even bleary eyed at this point, I’m energized and have unclogged a bit of a creative block. I like how I layed out the first book, but I don’t want all our books to look like clones lay out wise, and I want to retain the clarity (and improve it) of the space used. I was stuck on one particular pattern and how I wanted it to look and I licked it! Part of what drove me so hard, was being niggled all night after listening to Getting Loopy with Mary Beth Temple. Her guest was the editor of Crochet World Magazine. Now, I don’t see this magazine often in my area, but I have bought it in the past. I’m an equal opportunity crocheter, I like all kinds of patterns. I do not belong in the camp that believes crochet has to be all about fashion. I like fashion, and wearable crochet, but I also like hats, scarves and quick gift crochet, too. In fact I like kitsch, as the family of garden gnomes in my front yard can tell you, and my poor best friend has to put up with (though she’s bought me most of those gnomes!). So, it’s not the content I have a problem with, when I say the conversation on the show bothered me. That niggle stayed with me all evening, I tried to pin point what really bugged me about it. And as I finished off the pattern that was attempting to thwart my layout efforts, I realized what was really bothering me. We, in the chatroom, asked if they were planning to add charts and/or schematics. Charts are especially useful when working with thread or lace making. 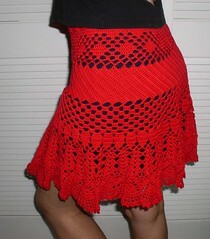 and Crochet World often has thread projects. The response was dismissive, and the pat answer of “Our market isn’t interested in this, none of our surveys indicated our readers want charts or schematics.” was given. My first thought was, did you ask on the survey if that’s what people wanted? It’s hard to indicate you want something if you don’t ask the question. I’ve never been polled by Crochet World, seen a poll by them or survey so I can’t say what was asked. Why the all or nothing attitude? Why is it so hard to have a chart or two, or a schematic now and then? Why not offer a little more, why be satified with what has always been? We’ve lost some very fine crochet magazines over the past five or six years. I don’t think it’s necessarily because crocheters don’t buy magazines, I think it’s because the folks who run the magazines forget to evolve and keep a value added nature to their publications. Things change, markets change, and if you are good at what you do, you make your market. I’m not saying replace written instructions with charts, or schematics, heck I like a mix of both. I don’t think all patterns require charts/schematics even. I do prefer my doilies and lace and fillet to have a chart versus just written instructions. I don’t think I’m alone. I don’t think I’m cutting edge in this desire, I think I’m shooting straight down the middle. So I ask you, what do you think? If you have two magazines to choose from with equal pattern types, will you pick the one with only written instructions/photos, or the one with written instructions/photos/ and charts &/or shematics. I kind of feel like The Count from Sesame Street…Five days…ah ah ah…Four days..ah ah ah…FOUR DAYS until The Flamies! AHAHAHAHAHAHAHAH…. Not that I’m excited, but I’m excited! Don’t forget the only place you can hear the awards is on Mary Beth Temple’s Getting Loopy! Hook the Vote! 2009 Crochet Awards! Welcome crochet enthusiasts to the first annual crochet awards, also known as the Flamies. Why Flamies? The Crochet Liberation Front has had an “award” on our message board on Ravelry that we call the “Flaming Crochet Hook of Justice” and so if we’re sponsoring an award; Flamie seemed most appropriate moniker. We ask that you search your heart and mind (and the internet) to choose how you vote for each person/organization/item in each category. The nominations were held for one week via the Crochet Liberation Front HQ on Ravelry.com, but that’s only 3091 voices! We invite all of our brother and sister crochet enthusiasts to vote for the BEST of what was crochet in 2008. To cast your vote go to this link if you don’t know who or what you want to vote for skip that category! It only takes a few minutes, and allows us as a community to show the BEST of what crochet can give to the world. Winners will receive a fantastic “trophy” for their website, and will be announced on Getting Loopy with Mary Beth Temple on March 16th so stay tuned! To my lovely CLF Minions, thank you for all of your nominations of me personally in various categories but I respectfully decline due to my sponsoring the awards. I did allow the CLF Book to be counted in nominations though, because that reflects a collaborative work beyond my individual effort. Please go to the LINK provided to vote, feel free to do some web surfing to check out the nominees, I’ve provided links where possible to assist in your decision making process! Blog this up folks, we want as many folks voting as possible! All nominees are listed in Alphabetical Order. Best Instructional/Technical Crochet Book 2008 Only books published in 2008 qualified for nominations. Best Crochet Pattern Book 2008 Only books published in 2008 qualified for nominations. Best Crochet Designer for Women’s Fashions 2008 (With six nominees due to ties) Ravelry ID’s are included where known to allow you to search their designs to make an informed decision.